So how do you earn money from your Solar PV system once it has been installed? 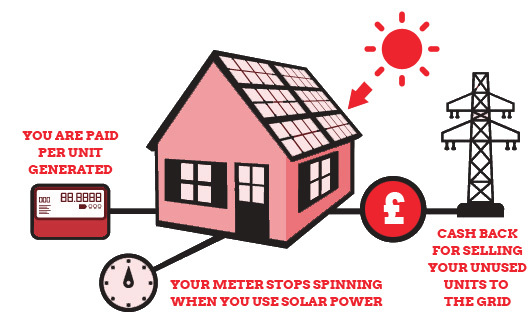 The Feed In Tariff Scheme is the UK Governments initiative which was introduced in April 2010 to encourage people to generate electricity from Solar power systems by offering financial support. Not only will you be paid through your electricity supplier for the electricity you generate, but you will also reduce your energy bills by as much as 50% in some cases and protect yourself from future energy price rises. What’s more, you will be paid again for any electricity which you do not use which you export to the national grid through your electricity supplier. To find out the latest rates view the information here supplied by OFGEM. So reducing your carbon footprint by installing Solar power systems will give you an immediate saving in your household energy costs from day one and start you on the path to earning more! The diagram below shows a simplified version of how the FIT’s process works. At Eden Power our specialist team of Solar panel installers will assess your property for solar suitability and fit them at a time convenient to you. To find out more about our services or to book our team of Solar PV installers, call us today on 01743 861004 or 07832977037. *Please use this video as a general guide only as FIT’s do change and may now be different rates to what are shown in this video.